Woke up to a dense fog. As we checked out, the Madame D’Hotel told me it would clear and be a beautiful sunny day (in French). An hour or so into our drive, she was right. Drove out through Sarlat on market day. We probably would’ve stopped but there was no parking, and we just wanted to get underway. 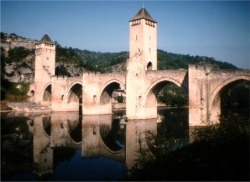 South to Cahors, where we bought tins of cassoulet and walked and drove over the medieval Pont Valentré ca. 1308. Drove around town, parked illegally, and bought provisions of bread, cheese, water, juice, etc. Then on the road again, stopping at the fortified hill town of Bruniquel for a quick stroll up and through the town. About 10 minutes down the road, we saw a sign for a view point leading up a narrow road, so we headed up and found it 50 yards off the road (no parking, of course). We parked on the side of the road, walked down, and spread our picnic cloth out and had our lunch with a view of a small town down below. Roosters crowing and bells ringing. All of France stops dead for lunch from 12-2. There’s no traffic, no one on the streets, shops all close. If you’re in a town walking around, you can smell food cooking, see families at their tables, and hear silverware clattering. Quite a contrast from the US! After Bruiniquel it was on to Albi. Saw the St .Cecile basilica, a monstrous brick fortified church built between 1180-1280. The carvings and paintings inside were tremendous. Then went inside the Toulouse-Lautrec museum. It was a little disappointing since it contained mostly sketches and no competed oils. Back into the car yet again for 2 more hours of driving to our final destination in Carcassonne. We got lost once or twice, and took many small side roads through many small villages, looking for a hotel outside Carcassonne. Jill found a listing for a small town outside the city limits in the Gault Millau guide. We got to the town but couldn’t find the hotel, so I stopped a woman walking a dog and asked for directions. We were on the street with the correct name, but she had not heard of the hotel in her own small town. Uh oh. She asked to look at the guidebook, and it turns out there is a town of the same name in a different region 2 hours away – they even have the same street name! She was extremely nice, and told us the only hotel in town was good – she was wrong, it was a dump! So we headed to Carcassonne. After a little driving around, we located a Rick Steves-recommended hotel at the gates of the medieval city – checked in and immediately hit the piscine (“beach”, meaning pool). Ahhhh. Then strolled around the medieval city (also from 800-900 years ago) before dinner of salad, cassoulet and flan (Jill) and sorbet (Dave) at La Table Ronde, shaded by trees on a terrace. Came back, called Mom & Dad, sat down to write. A walk around the ramparts tomorrow morning, before the tourists arrive!